Custom business bags will allow you to promote your brand and nurture your employees and business partners to shoulder your brand responsibility with pride. 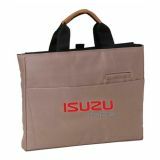 These promotional bags will instill a sense of professionalism and allow them to stay organized to meet their daily work goals and counter their work challenges with a calm attitude. 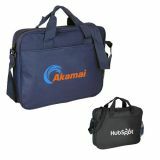 You can avail the best price benefits on bulk orders of these customized business bags. Prices include artwork assistance and online design proof. We ship anywhere within the contiguous USA. Advertising is getting expensive by day so why don’t you encourage your clients, employees and customers to do it for you? 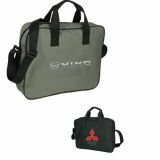 It is easier to coax them by giving any of our personalized business bags. Whether it is logo printed business briefcases, custom messenger bags, personalized portfolio bags, promotional attaché cases or recycled tablet sleeve messenger bags, they make an ideal employee orientation gift. Your employees, clients and customers will be reminded of your brand and their professional responsibilities every day. 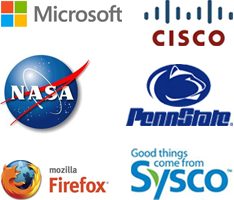 It will save them time from finding things and perform efficiently while fulfilling their work responsibilities. Most professionals and business people love to carry nice messenger bags and briefcases to work or during travel due to obvious reasons which are easy storage, manage essentials effortlessly and lending a confidence to their personality. Remember a satisfied and happy employee can contribute to your business more than anyone else. Ensure that your employees or customers always get what they want to get the job executed with a user-friendly laptop bag or slim business briefcase. 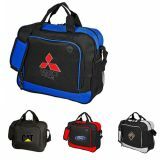 High quality messenger bags are always crowd pullers and they will let people to think seriously about your business. Custom printed document bags will allow your employees to secure their documents effortlessly while imprinted portfolio bags help them to stay organized and face the competition with composed mind. 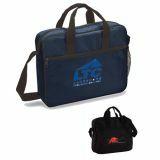 You can give away these promotional business bags during tradeshows, corporate events, as business gifts or bonuses to your employees. 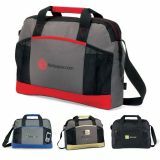 You can add a personal touch to each of these business bags by screen printing, full color decoration and embroidery. 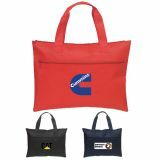 When you give out embroidered or full color printed messenger bags or briefcases to your customers, you can remain assured that your brand logo will go places. They will be seen on trains and public transport systems, when your employees carry them to the workplace. They will be seen on the streets and admired when your employees walk to the office after getting down at the nearest metro station. They will be seen and appreciated by your clients visiting your office. This means logo printed business bags will be seen by everyone and everywhere. 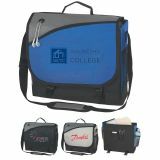 All logo printed business bags offered in our selection will serve as billboards for your business logo. So you should consider carefully before investing in them. If you are puzzled about the right kind of bag for your business, our team of promotional experts will help you in making the right selection. Call us at 888-560-2247 to know more about any of these business bags.